Grinding, besides drilling, is one of the best known chip removal production methods because it is also frequently used during daily activities. In metalworking, grinding is mainley used to grind smooth surfaces. The advantages of grinding include the capability to machine hard materials and very precise process in terms of size and shape. Grinding is generally used at the end of a machining process to guarantee the highest degree of precision during the finishing of the workpiece. 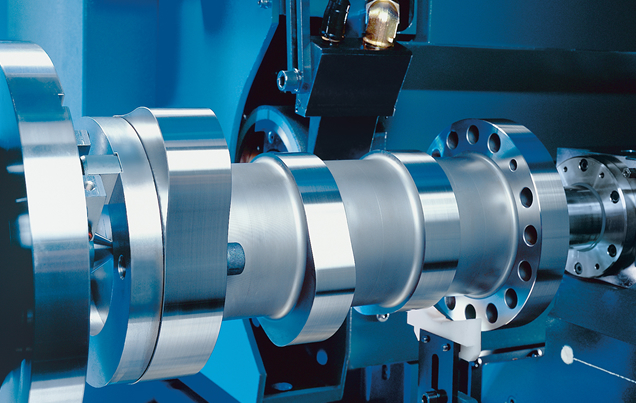 This is necessary because many classic production technologies, such as turning, do not achieve the required level of precision or leave behind machining marks (e.g. scroll) on the workpieces; which must be removed by grinding. The crankshaft grinders of the PM Series, offer the highest precision for the machining of non-circular shafts such as crankshafts. The same holds for the camshaft grinding machines of the SK and SN Series. All workpieces are rounded off, in the true sense of the word, on the circular grinding machines like the VLC 100 G or the external cylindrical grinding machines of the HG Series. Perfect roundness for perfect prints on impression cylinders are done on the RD series.